Apple have announced the fifth generation of iPod. Improvements include better battery life, a thinner enclose, better screen and now in both black and white. But not everything is peachy. Gone is the FireWire support, the remote socket and there is still no sign of Bluetooth. Quite how you are supposed to switch tracks without pulling your iPod out your pocket I’m not sure. The big hoopla is video on your iPod and I’m not impressed. When exactly could you watch video on your iPod? Not while jogging, driving or walking which seem to be the popular regular usage if the accessories are anything to go by. Ignoring that, you can now watch a music video, Pixar short or (if you live in the US) a TV show on a 2.5″ non-wide-screen display at 320×240 resolution. They expect $1.99 for the privilege of viewing this tiny short content previously free elsewhere. It’s like wide-screen and high definition never happened. If you have a TV or computer to hand you can play your DRM’ed media on a big screen but frankly 320×240 scaled up will look dire at 17″ and probably induce nausea above 32″. 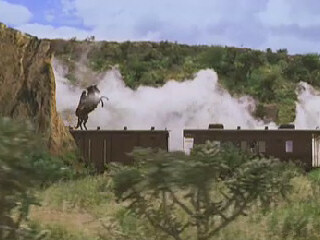 Unscaled it would be as big as this capture from Zorro 2. Best of all the quoted time for battery life when watching video’s is up to whopping three hours. (I lied about stopping the sarcasm). Want to watch video on the move? Get yourself a portable DVD player, a small laptop or if it really must be hand-held a PSP. The PSP has a bigger 4.3″ wide-screen display, UMD movie discs and 4-5 hour battery life. As a bonus you can play games, surf the web wirelessly, play music and check out a memory stick full of photos. For less than the price of an iPod Video. Sony have also just announced Location Free TV client for the PSP that lets you watch whatever your own base-station at home is connected to. Apple do have a new remote control available real soon but it only works with your iPod while it is connected to the universal dock. The universal dock is a good idea – one dock for all the iPods – especially useful for a family or individual with more than one iPod. What I’d like to know is if Apple will enable Macs connected to a universal dock to be controlled in the same way as the new iMac. A direct heads up to media centre style interfaces of Windows Media Centre Edition, Sony’s PSP and the forthcoming Xbox 360 comes Apple’s FrontRow. Big colorful icons, massive text – just what you’d want on your TV… but curiously only available on the iMac, now available with both 17″ and 20″ widescreen displays again as last seen on the iLamp model. iTunes 5 has been out a whole month and Apple think the addition of buying videos justifies a whole new version number. Apart from this the only other changes seem to be a couple of minor cosmetics. I guess they are desperately trying to catch up version numbers with RealPlayer and Windows Media Player. I wonder what other features they can add/borrow from other apps now that video has been nabbed from QuickTime and syncing from iSync. How much longer before it is renamed iKitchenSink? For more commentary check out these BoingBoing or DaringFireball commentaries. Apple hosted a media event yesterday, here’s my usual opinionated commentary. iTunes 5 is now out – ditching the scrappy brushed-metal look in favour of the Apple Mail inspired ‘platinum’ look even on Windows. With luck we can expect the next major release of Mac OS X to take this theme across the board and finally kill off the aqua stripes and brushed metal. Let’s just hope they keep the older sane toolbars and not the Safari/Mail abominations. The rumors of Apple replacing it’s hard-disk based mini line with flash based models were indeed true. The new Nanos are MUCH slimmer with better battery life and color screens. You can have any color you like, as long as it’s black… or white. Once again audio-book pricing is off the scale with the CD’s weighing in at £219.86. iTunes shaves 10% off this to get it just under £200 in exchange for all resale value, having a physical disk and the ability to rip/convert to any format you like. Doesn’t really seem worth the 10% saving to me. By comparison the books will cost you just under £50, so audio-books cost 400% more! The cost of producing the CD’s seems to consist of a narrator, a recording studio and some editing – all one-off production costs. Selling more CD’s at a lower margin would seem to be the more sensible option. If you are previewing a song in the music store then it will be abruptly halted the moment you visit another page. Let me just clarify that, people are here to listen to music they might want to buy and you are forcing them to spend most of their time sitting in silence while they browse. Can you get any stupider? It’s easy for Apple to fix, simply add underneath “Music Store” in the “Source” list a “Previews” play list. Every time a user clicks on a track add it to that ready to be played after the current preview finishes it’s 30 second play. Leave them there for a couple of hours perhaps and let them jump back and re-listen to a preview they are still considering, even if it streams again. I own a fair few number of DVDs, some of which would lend themselves quite well to listening on my iPod, indeed a few of the comedy ones are available from the iTunes Music Store but I’ll be damned if I’m paying another £7.95 for something I already legally own. OGG is an open-source audio codec with a lot going for it and I’d really like to be able to use this format. I understand Apple don’t want to offer it because they want you to use their own AAC format. Bear in mind that Sony wanted everyone to use ATRAC instead of MP3 and look where that got them1. Apple have partially fixed this at least in iTunes now, when you switch playlist it remembers whether you were shuffling when you last used that playlist but the iPod won’t take note :( Really, it should be a setting on the playlist itself “Shuffle: Use player status, Always on, Always off”. Music should shuffle but shuffling the multi-track audio-books I’ve ripped from my own CD’s should definitely not. Well this isn’t really Apple’s fault but this adapter has two annoying problems. The first is that it only displays the first eight letters of each song name and won’t scroll them unless you go into a menu… And that scrolling setting only lasts until you come out of the menu! Secondly when choosing artists, playlists, genre’s etc the unit actually starts to play the first song from that selection… while you are trying to switch and causes a not insignificant delay. This makes it impossible to scroll through artists, you’d take forever. Why it can’t just wait a few seconds before firing off the track or wait for you to press next song I’ve no idea. Sony lost the portable audio market they’d practically owned with the Walkman brand for over a decade for fear of cutting into another business unit’s profits, specifically their music labels. We’ve seen this pattern time and time again, British Telecom lost it’s stranglehold on UK telecom customers by dragging it’s heels with mobile technology for fear of cutting into its payphone business. Nintendo lost the console market by refusing to use CD-ROM technology for fear of lost profits on cartridge production/piracy. Atari refused Jay Miner the chance to develop a 16-bit system for fear of damaging the revenues of the 8-bit systems he had designed them. He left, created the Amiga and handed it over to rival Commodore who would dominate Atari for the next 10 years. The moral of this story is move with the technology because your customers will. If you’re not there for them, somebody else will be.